That seems like a bit of an extreme practice! Positive thinking can be beneficial as some physical ailments are a result at least partly of negative thought manifestation, but to assume all ailments are is quite irresponsible! I saw the play “Gas Light” several years ago, so I understand how “gaslighting” became a term for the tool of psychological abuse depicted in that drama. And yes, I can see how it is a common form of abuse in Christian Science (there is a tragic example of CS gaslighting in Barbara Wilson’s memoir “Blue Windows” as her mother descends into madness). In the play, the husband is a malevolent abuser who intends to drive his wife mad. In CS, however, a Christian Science nurse or practitioner is not intentionally malevolent–they believe the lie too. The abuser is Christian Science itself. Since leaving CS I’ve heard a lot of “it isn’t the person, it is the religion” I agree, to an extent. At what point does the person realize how harmful the religion is and what do they do about it? How awful do things have to get before someone is willing to admit (to themselves or otherwise) that it is a mistake? I’ve met life-long CS who openly admit to “having xyz condition” but are adamantly unwilling to go to a doctor to get it treated, and have repeatedly stated they “would rather die” than accept medical treatment. It is NOT “just the religion” that is the problem, it is the people who are attracted to it, who stay with it, and who perpetuate it, often selectively and willingly “ignorant” of the damage they are causing. 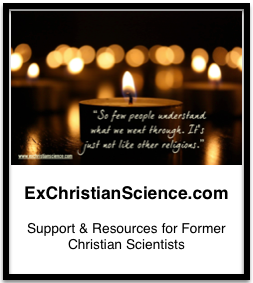 You ask a very good question, Kat: “At what point does the person realize how harmful the religion is and what do they do about it?” It is astonishing that many people stay with Christian Science even after they have doubts or have had a bad experience. But many educated, intelligent people do so (and I did for many years), so it is not simply a matter of logic. The answer, I believe, may be found in understanding the psychology of charismatic groups. I have done some reading on this topic, and it is amazing how otherwise rational people will defend a group’s belief system in the face of appalling evidence that it is harmful to themselves and others. Powerful psychological forces keep people tied to abusive groups and relationships, and I believe such forces are at work in Christian Science. Yes, but they’re just not practicing it properly. if it was practiced properly it would totally work. Powerful psychological forces keep people tied to abusive groups and relationships, and I believe such forces are at work in Christian Science. Yes, I have run into Christian Science friends that are gas lighted up. In fact the very first Christian Scientist I ever met has a physical problem that has gone on for a few years. I have told him to get medical help as at this point the prayers aren’t showing progress. Of course he won’t do anything else. Physically, he is an extremely strong and tough human being, and that is my guess why he has been going along in a normal way without any problems. In any case, it’s a broken record speaking with him. Another thing though, and it goes in a different direction than the readers of this blog. When introduced to Christian Science while in high school, I was hanging around liberally minded Christian Scientists. They weren’t gas lighted or brain washed. It was a true pleasure and got me on a proper common sense track about Christian Science. I wish that some of the members of this group had had a similar exposure to that liberal type of Christian Scientist instead of the fundamentalists. To power to conform is a problem. It’s almost a fraternal thing.